In a previous post (), I mentioned that the idea of gaining muscle and losing fat at the same time seems impossible to most people because of three widely held misconceptions: (a) to gain muscle you need a calorie surplus; (b) to lose fat you need a calorie deficit; and (c) you cannot achieve a calorie surplus and deficit at the same time. 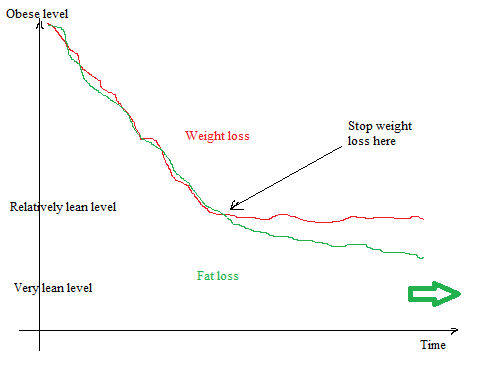 The scenario used to illustrate what I see as a non-traumatic move from obese or seriously overweight to lean is one in which weight loss and fat loss go hand in hand until a relatively lean level is reached, beyond which weight is maintained constant (as illustrated in the schematic graph below). If you are departing from an obese or seriously overweight level, it may be advisable to lose weight until you reach a body fat level of around 21-24 percent for women or 14-17 percent for men. Once you reach that level, it may be best to stop losing weight, and instead slowly gain muscle and lose fat, in equal amounts. I will discuss the rationale for this in more detail in my next post; this post will focus on addressing the misconceptions above. Before I address the misconceptions, let me first clarify that, when I say “gaining muscle” I do not mean only increasing the amount of protein stored in muscle tissue. Muscle tissue is mostly water, by far. An important component of muscle tissue is muscle glycogen, which increases dramatically with strength training, and also tends to increase the amount of water stored in muscle. So, when you gain muscle, you gain a significant amount of water. Now let us take a look at the misconceptions. The first misconception, that to gain muscle you need a calorie surplus, was dispelled in a previous post featuring a study by Ballor and colleagues (). In that study, obese subjects combined strength training with a mild calorie deficit, and gained muscle. 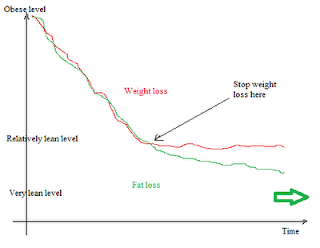 They also lost fat, but ended up a bit heavier than at the beginning of the intervention. Another study along the same lines was linked by Clint (thanks) in the comments section under the last post (). The second misconception, that to lose fat you need a calorie deficit; is related to the third, that you cannot achieve a calorie surplus and deficit at the same time. In part these misconceptions are about semantics, as most people understand “calorie deficit” to mean “constant calorie deficit”. One can easily vary calorie intake every other day, generating various calorie deficits and surpluses over a week, but with no overall calorie deficit or surplus for the entire week. This is why I say that one can achieve a calorie surplus and deficit “at the same time”. But let us make a point very clear, most of the evidence that I have seen so far suggests that you do not need a calorie deficit to lose fat, but you do need a calorie deficit to lose structural weight (i.e., non-water weight). With a few exceptions, not many people will want to lose structural weight by shedding anything other than body fat. One exception would be professional athletes who are already very lean and yet are very big for the weight class in which they compete, being unable to "make weight" through dehydration. Perhaps the most surprising to some people is that, based on my own experience and that of several HCE () users, you don’t even need to vary your calorie intake that much to gain muscle and lose fat at the same time. You can achieve that by eating enough to maintain your body weight. In fact, you can even slowly increase your calorie intake over time, as muscle growth progresses beyond the body fat lost. And here I mean increasing your calorie intake very slowly, proportionally to the amount of muscle you gain; which also means that the incremental increase in calorie intake will vary from person to person. If you are already relatively lean, at around 21-24 percent of body fat for women and 14-17 percent for men, gaining muscle and losing fat in equal amounts will lead to a visible change in body composition over time () (). Two key requirements seem to be common denominators for most people. You must eat protein regularly; not because muscle tissue is mostly protein, but because protein seems to act as a hormone, signaling to muscle tissue that it should repair itself. (Many hormones are proteins, actually peptides, and also bind to receptor proteins.) And you also must conduct strength training to the point that you are regularly hitting the supercompensation window (). This takes a lot of individual customization (). You can achieve that with body weight exercises, although free weights and machines seem to be generally more effective. Keep in mind that individual customization will allow you to reach your "sweet spots", but that still results will vary across individuals, in some cases dramatically. If you regularly hit the supercompensation window, you will be progressively spending slightly more energy in each exercise session, chiefly in the form of muscle glycogen, as you progress with your strength training program. You will also be creating a hormonal mix that will increase the body’s reliance on fat as a source of energy during recovery. As a compensatory adaptation (), your body will gradually increase the size of its glycogen stores, raising insulin sensitivity and making it progressively more difficult for glucose to become body fat. Since you will be progressively spending slightly more energy over time due to regularly hitting the supercompensation window, that is another reason why you will need to increase your calorie intake. Again, very slowly, proportionally to your muscle gain. If you do not do that, you will provide a strong stimulus for autophagy () to occur, which I think is healthy and would even recommend from time to time. In fact, one of the most powerful stimuli to autophagy is doing strength training and fasting afterwards. If you do that only occasionally (e.g., once every few months), you will probably not experience muscle loss or gain, but you may experience health improvements as a result of autophagy. The human body is very adaptable, so there are many variations of the general strategy above. On 11 April 2018 a full-day workshop on PLS-SEM will be conducted by Dr. Ned Kock and Dr. Geoffrey Hubona, using the software WarpPLS. Dr. Kock is the original developer of this software, which is one of the leading PLS-SEM tools today; used by thousands of researchers from a wide variety of disciplines, and from many different countries. Dr. Hubona has extensive experience conducting research and teaching topics related to PLS-SEM, using WarpPLS and a variety of other tools. This workshop will be hands-on and interactive, and will have two parts: (a) basic PLS-SEM issues, conducted in the morning (9 am - 12 noon) by Dr. Hubona; and (b) intermediate and advanced PLS-SEM issues, conducted in the afternoon (2 pm - 5 pm) by Dr. Kock. Participants may attend either one, or both of the two parts. The following topics, among others, will be covered - Running a Full PLS-SEM Analysis - Conducting a Moderating Effects Analysis - Viewing Moderating Effects via 3D and 2D Graphs - Creating and Using Second Order Latent Variables - Viewing Indirect and Total Effects - Viewing Skewness and Kurtosis of Manifest and Latent Variables - Viewing Nonlinear Relationships - Solving Collinearity Problems - Conducting a Factor-Based PLS-SEM Analysis - Using Consistent PLS Factor-Based Algorithms - Exploring Statistical Power and Minimum Sample Sizes - Exploring Conditional Probabilistic Queries - Exploring Full Latent Growth - Conducting Multi-Group Analyses - Assessing Measurement Invariance - Creating Analytic Composites.